Given recent seismic activity — political as well as geological — it’s perhaps unsurprising that two books on earthquakes have arrived this season. One is as elegant as the score of a Beethoven symphony; the other resembles a diary of conversations overheard during a rock concert. Both are interesting, and both relate recent history to a shaky future. 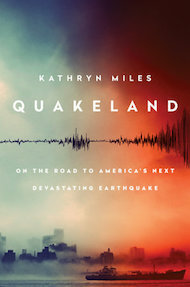 Journalist Kathryn Miles’s Quakeland is a litany of bad things that happen when you provoke Earth to release its invisible but ubiquitous store of seismic-strain energy, either by removing fluids (oil, water, gas) or by adding them in copious quantities (when extracting shale gas in hydraulic fracturing, also known as fracking, or when injecting contaminated water or building reservoirs). To complete the picture, she describes at length the bad things that happen during unprovoked natural earthquakes. As its subtitle hints, the book takes the form of a road trip to visit seismic disasters both past and potential, and seismologists and earthquake engineers who have first-hand knowledge of them. Their colourful personalities, opinions and prejudices tell a story of scientific discovery and engineering remedy. Miles poses some important societal questions. Aside from human intervention potentially triggering a really damaging earthquake, what is it actually like to live in neighbourhoods jolted daily by magnitude 1–3 earthquakes, or the occasional magnitude 5? Are these bumps in the night acceptable? And how can industries that perturb the highly stressed rocks beneath our feet deny obvious cause and effect? In 2015, the Oklahoma Geological Survey conceded that a quadrupling of the rate of magnitude-3 or more earthquakes in recent years, coinciding with a rise in fracking, was unlikely to represent a natural process. Miles does not take sides, but it’s difficult for the reader not to. She visits New York City, marvelling at subway tunnels and unreinforced masonry almost certainly scheduled for destruction by the next moderate earthquake in the vicinity. She considers the perils of nuclear-waste storage in Nevada and Texas, and ponders the risks to Idaho miners of rock bursts — spontaneous fracture of the working face when the restraints of many million years of confinement are mined away. She contemplates the ups and downs of the Yellowstone Caldera — North America’s very own mid-continent supervolcano — and its magnificently uncertain future. Miles also touches on geothermal power plants in southern California’s Salton Sea and elsewhere; the vast US network of crumbling bridges, dams and oil-storage farms; and the magnitude 7–9 earthquakes that could hit California and the Cascadia coastline of Oregon and Washington state this century. Amid all this doom, a new elementary school on the coast near Westport, Washington, vulnerable to inbound tsunamis, is offered as a note of optimism. With foresight and much persuasion from its head teacher, it was engineered to become an elevated safe haven. Miles briefly discusses earthquake prediction and the perils of getting it wrong (embarrassment in New Madrid, Missouri, where a quake was predicted but never materialized; prison in L’Aquila, Italy, where scientists failed to foresee a devastating seismic event) and the successes of early-warning systems, with which electronic alerts can be issued ahead of damaging seismic waves. Yes, it’s a lot to digest, but most of the book obeys the laws of physics, and it is a engaging read. One just can’t help wishing that Miles’s road trips had taken her somewhere that wasn’t a disaster waiting to happen. Catastrophic damage in Anchorage, Alaska, in 1964, caused by the second-largest earthquake in the global instrumental record. In The Great Quake, journalist Henry Fountain provides us with a forthright and timely reminder of the startling historical consequences of North America’s largest known earthquake, which more than half a century ago devastated southern Alaska. With its epicentre in Prince William Sound, the 1964 quake reached magnitude 9.2, the second largest in the global instrumental record. It released more energy than either the 2004 Sumatra–Andaman earthquake or the 2011 Tohoku earthquake off Japan; and it generated almost as many pages of scientific commentary and description as aftershocks. Yet it has been forgotten by many. The quake was scientifically important because it occurred at a time when plate tectonics was in transition from hypothesis to theory. Fountain expertly traces the theory’s historical development, and how the Alaska earthquake was pivotal in nailing down one of the most important predictions. The earthquake caused a fjordland region larger than England to subside, and a similarly huge region of islands offshore to rise by many metres; but its scientific implications were not obvious at the time. Eminent seismologists thought that a vertical fault had slipped, drowning forests and coastlines to its north and raising beaches and islands to its south. But this kind of fault should have reached the surface, and extended deep into Earth’s mantle. There was no geological evidence of a monster surface fault separating these two regions, nor any evidence for excessively deep aftershocks. The landslides and liquefied soils that collapsed houses, and the tsunami that severely damaged ports and infrastructure, offered no clues to the cause. “Previous earthquakes provide clear guidance about present-day vulnerability.” The hero of The Great Quake is the geologist George Plafker, who painstakingly mapped the height reached by barnacles lifted out of the intertidal zone along shorelines raised by the earthquake, and documented the depths of drowned forests. He deduced that the region of subsidence was the surface manifestation of previously compressed rocks springing apart, driving parts of Alaska up and southwards over the Pacific Plate. His finding confirmed a prediction of plate tectonics, that the leading edge of the Pacific Plate plunged beneath the southern edge of Alaska along a gently dipping thrust fault. That observation, once fully appreciated, was applauded by the geophysics community. Fountain tells this story through the testimony of survivors, engineers and scientists, interweaving it with the fascinating history of Alaska, from early discovery by Europeans to purchase from Russia by the United States in 1867, and its recent development. Were the quake to occur now, it is not difficult to envisage that with increased infrastructure and larger populations, the death toll and price tag would be two orders of magnitude larger than the 139 fatalities and US$300-million economic cost recorded in 1964. What is clear from these two books is that seismicity on the North American continent is guaranteed to deliver surprises, along with unprecedented economic and human losses. Previous earthquakes provide clear guidance about the present-day vulnerability of US infrastructure and populations. Engineers and seismologists know how to mitigate the effects of future earthquakes (and, in mid-continent, would advise against the reckless injection of waste fluids known to trigger earthquakes). It is merely a matter of persuading city planners and politicians that if they are tempted to ignore the certainty of the continent’s seismic past, they should err on the side of caution when considering its seismic future.